Surprising news that came to my attention on Thursday (6th July) has cut through my backlog of partly-written blog posts and given me something I can cover quickly. 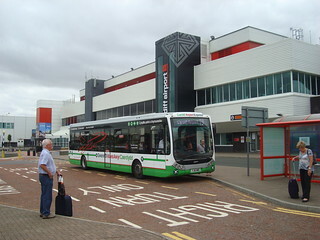 Fountain Of Freedom: Aberystwyth bus station (pictured, with a T1 service present) is a hub for TrawsCymru services, being served by 5 of the 8. This week (3rd – 9th of July) happens to be ‘Catch The Bus Week’ 2017 and the Welsh Government have come up with a surprising scheme to encourage people to do just that; catch the bus. Today (Saturday 8th July) is the first day covered by the new initiative, which is to make travelling on TrawsCymru network free of charge all weekend. 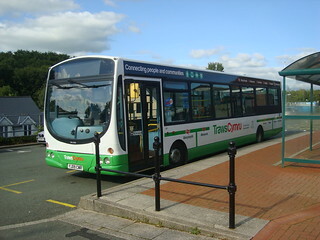 Ready To Give Free Rides: Wright Pulsar at Haverfordwest waiting to form a TrawsCymru T5 service to Cardigan. That’s right, free weekend travel on all 8 TrawsCymru services, including the Cardiff Airport Express and the occasional long haul from Aberystwyth to Cardiff. It isn’t just this weekend either; free weekend travel on TrawsCymru is being offered on a trial basis ‘until further notice’ although according to the poster I spotted on Thursday the offer excludes bank holidays (not sure if Easter Sunday counts as a bank holiday). The Welsh Government Website states that the pilot will run until at least May 2018. In On The Action: The Cardiff Airport Express is officially part of the TrawsCymru network and therefore included in the free travel pilot. 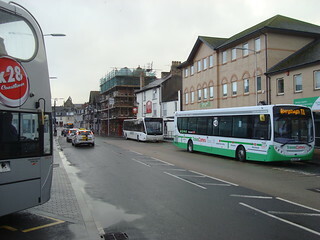 Perhaps even more surprising than the introduction of free travel at weekends is that the Carmarthen-Cardiff section of the T1C Aberystwyth-Cardiff service is included (in the last phase of TrawsCambria, the X40 service did not except the Concessionary Travel Pass, which gives free travel on all bus services in Wales for the elderly and disabled). While I welcome this initiative in the main, the waiving of fares on the Cardiff Airport Express is a bit of a disappointment, but not because I think making the service free (even if only at weekends) is necessarily a bad idea. Rather, I’m disappointed because it suggests that the Welsh Government are still treating it as a normal TrawsCymru service, when I would much rather it be its own thing (because it has very little in common with the rest of the network; isn’t long-distance for example).